Louisville Dance Studio lessons. Blair's Ballroom, dance instruction for Ballroom, Argentine Tango, Swing, Salsa, ChaCha, Waltz, Competition, Wedding dance and many more. Beginners welcomed! On Select Fridays, Join Us For Louisville's Best Friday Dance Party! Dance Ballroom, Latin, Swing, Country, Tango, etc. with Louisville's Friendliest Dancers. 8:00 until 11:00. $12. Includes beverages and hors d'oeuvres. Check our schedule on the Home Page for details. 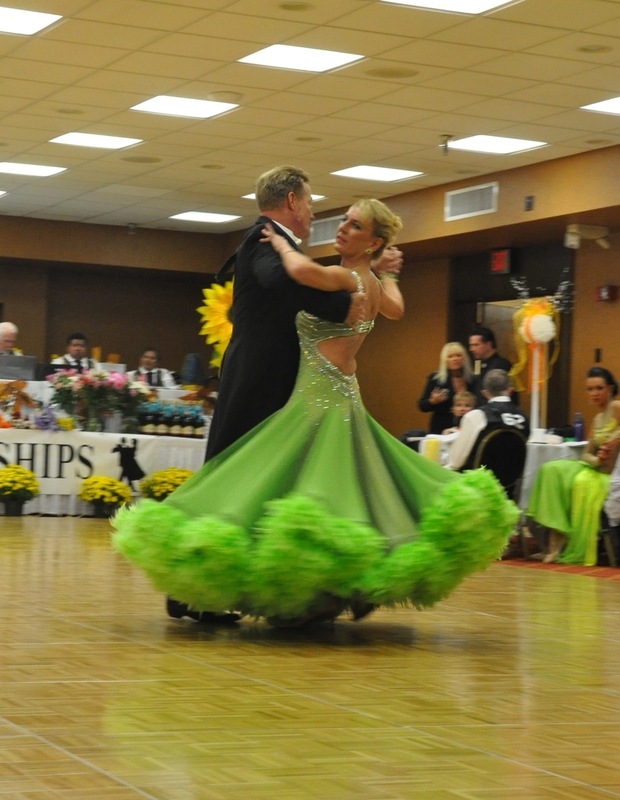 Our instructors, Andy and Christy, have competed in major National and International Ballroom Championships and want to share their passion and years of experience with the serious Ballroom Dancer afire with a competitive spirit! Please contact us for information. Argentine Tango: The Tango is one of the most fascinating of all ballroom dances. This sensual ballroom dance originated in South America in the early twentieth century. Bolero: The modern bolero is danced to a slow-quick-quick rhythm with long, gliding steps to the side on the slow beat and a rock-step, either forward or backward, on the quick-quick beats. Many of the patterns done in the Rumba have slower, measured counterparts in the Bolero. The dance often has a theme of approach and turning away—the tensions of a couple falling in love. Cha Cha: The Cha Cha is a lively, flirtatious ballroom dance full of passion and energy. The classic "Cuban motion" gives the Cha Cha its unique style. Partners work together to synchronize each movement in perfect alignment. Rumba: The Rumba is considered by many to be the most romantic and sensual of all Latin ballroom dances. It is often referred to as the "Grandfather of the Latin dances. Salsa: The essential elements of modern salsa dance, music and culture can be traced to Cuba. It is the uniquely Cuban sound known as the Son Cubano that makes up the musical DNA of what is today called salsa. The energetic rhythmic phrases combined with the instrumentation – particularly the guitar and a close Cuban relative known as the tres- with repeating melodies and phrases called guajeos, descended from traditional Spanish folk melodies. By the 1920s, couples in Havana nightclubs had stirred into the dance mix generous helpings of tango, mambo, and flamenco, and the style began to spread throughout the Caribbean and Latin America. Samba: Possibly the most popular of all Brazilian ballroom dances, the Samba is popular with young people as well as older generations. The Samba can be performed solo or with a partner. Viennese Waltz: The Viennese Waltz is a quick rotating ballroom dance with a subtle rise and fall. It is considered by most to be one of the most difficult dances to learn. The simple and elegant rotational movement characterizes the Viennese Waltz. Waltz: The Waltz is one of the smoothest ballroom dances. It is a progressive dance marked by long, flowing movements, continuous turns, and "rise and fall." The dance is so graceful and elegant, Waltz dancers appear to glide around the floor with almost no effort. Louisville's Best Friday Dance Party - Louisville Ballroom Dancing for over 20 years - Home of Louisville Argentine Tango - Private and Group Lessons in Ballroom, Argentine Tango, Swing and Latin from Andy Blair and Christy Byers, Louisville's Finest Ballroom Dance Instructors - Group Lessons in Argentine Tango, Ballroom, Swing, and Latin - Blair's Ballroom, Where Dancing is Fun!